President Trump Won’t Start a Trade War; and China Knows It. In what was clearly a nod to his political base, President Trump ratcheted up his tough talk against China this week, announcing $50B in tariffs on Chinese goods, including everything from washing machines to chemicals. China, not surprisingly, quickly retaliated with $50B in tariffs on American goods, causing the stock market to plunge on fears of an insipient trade war. 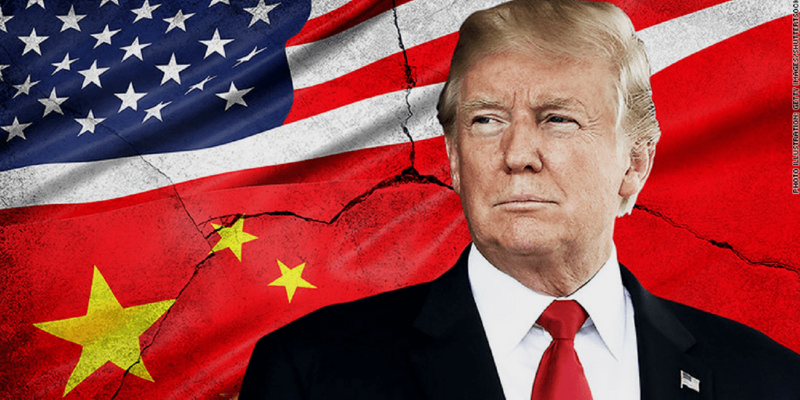 Seemingly unprepared for China’s response, and the market’s drop, the president’s own advisors quickly walked back Trump’s rhetoric, and left open the possibility that the tariffs-proposals may never go into effect. While the president continues making threats, raising the prospect of an additional $100B in tariffs in a “plan” Republican Senator Ben Sasse called “nuts”, we think the prospect of a full-scale trade war remains slim. Why? Despite Trump’s bluster, he knows he is in no position to start a trade war, and so does China. Starting a trade war with China would almost certainly knock the U.S. economy off course, just four months after the Republicans enacted tax cuts that need to drive higher economic growth to pay for the $1,500,000,000,000 in debt the tax cuts will generate. A recession now, on the heels of the tax cut, would mean almost certain bloodbath for Republicans in the mid-term elections and impeachment peril for the president. Give China credit for hitting the President where it hurts. While the initial bravado of the tariffs was clearly aimed at appeasing the hearts and minds of Trump’s political base, the Chinese retaliated by hitting Trump’s base somewhere even more impactful: their wallets. The Chinese, appearing to target Trump politically, rather than just the U.S. economically, have threatened to apply tariffs mostly to agriculture (soybeans, corn, and orange juice) all largely produced in swing states won by Trump in the 2016 election (Iowa, Wisconsin, Michigan, Ohio, Pennsylvania and Florida). 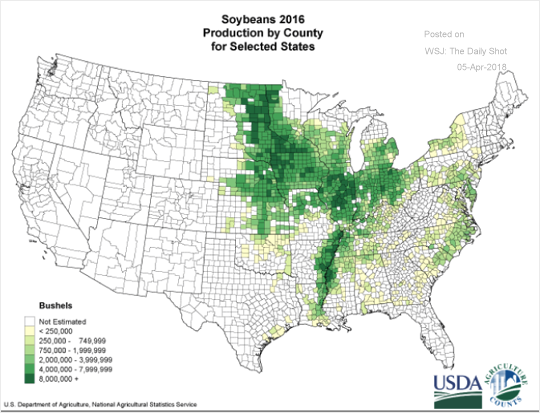 As an example, notice the similarities in the two charts below, the first showing counties where Trump increased the Republican Vote (red), the second, counties responsible for the largest soybean production (dark green). All of this is not to say the president is wrong that China is a “bad actor” on world trade. They are, particularly in regards to intellectual property, where American companies in China are forced to form a joint venture with a local firm, and transfer their proprietary technology to them. However, the president, focused solely on the size of the trade deficit, appears to be missing this point, and is now making threats he can’t back up, while backing China into a very public corner. We believe the president views the threat of tariffs (which wouldn’t go into effect for months) as a starting point for negotiations, and a means of generating positive “PR” with his base, not as policy. For example, while reveling in the announcement of the tariffs on all steel and aluminum, the president later, under pressure, provided exemptions to Canada, Mexico and Australia, significantly lessening their impact. The president’s tactics have been similar on other issues too, such as when he threatened to veto the latest spending bill on Twitter, only to sign the bill, begrudgingly, one hour later. The president’s impulsiveness in cancelling the Trans Pacific Partnership, an agreement between 12 nations representing 40% of the world’s GDP as a means of countering China’s growing economic influence, has severely undercut our negotiating position with China. Since Mr. Trump has walked-back almost every one of his incendiary proposals, we expect that will also be the case with his tariffs. We continue to believe that the market will eventually pay more attention to increasing company earnings, low unemployment and solid GDP numbers this year.